Many apps are going to help you in typing fonts of different languages. The default language of most devices is the English language. You could try typing of other fonts by getting an app that is designed on other language fonts for your device. If you need to type Sinhala fonts, you will find the Helakuru app as the best app for Sinhala typing. Statistics state that nearly 3 Million Users have used this app for their services. The app has also covered certain achievements by winning the NYDB Awards in 2016, the mBillionth South Asian International Award in 2014, the E-Swabhimani National Award in 2013, the NBQSA National Award in 2014 & the award for Sri Lanka’s Best Local Language Product Award in 2014. The Helakuru app works by letting its users type in Sinhala after downloading the app onto their mobile phones. Its keyboard layouts come in two variations as the Smart Phonetic & Smart Wijesekara keyboard layouts for Sinhala typing. The app also suggests word predictions while you type in Sinhala. The app also has voice typing for both Sinhala as well as the English language. Beginners, as well as experts both, could try this wonderful Sinhala typing app. Download this app and see what this app offers you. In this application, voice typing comes as English as well as Sinhala. You have the voice typing feature which is designed for both languages including Sinhala & English. This voice typing works with the support of the Google Speech Recognition. This feature is organized by Bhasha, and in this option, you could also type in Sinhala or English without placing your fingers on the keyboard. Only, you have to press the mike and start speaking. The Helakuru application also includes a theme store where you have beautiful keyboard themes. You can select from themes that the application offers you or you can create a theme that you like. It is possible for you to create your own theme by choosing a color and a background image. Further, its latest feature is that it offers you the Helakuru Plus Portal which allows you to type in Sinhala and view Sinhala news on TV or radio. It also streams through the Sinhala notifications and brings you alerts. The keyboard is also designed inclusively of all your favorite emojis. The word prediction feature helps you in deciding the exact you want to fit into the sentence while you are typing. With two taps on the predictions that appear you could type Sinhala words easily. As you go on typing, suggestive Sinhala words appear at the bottom, and you will have to choose the word that you need from the predictions. You will not have to waste time by typing letter by letter. This feature also helps you in learning by own; self-learning. When you see new words appearing, you tend to learn them. You would not have an idea of some words that appear. So you tend to learn those new words and add them to your vocabulary. Words that appear as predictions then automatically save on the device. What are the other features that Helakuru offers you? Helakuru does not only support Sinhala, but it also has input for the English language. You can use this keyboard for two purposes as to type Sinhala as well as the English language. If you want to switch between the two languages, you will simply have to touch the globe key. Its keyboard layout is also fascinating. Helakuru offers you the Standard Wijesekara keyboard layout. 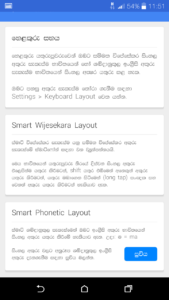 Using this layout, you can type Sinhala. The other layout it offers you is a transliteration keyboard layout. You would find this layout interesting because this layout has an input of Sinhala phonetics. You will find it easy to type with this layout. For example, you could type phonetically the word “ammaa” for “අම්මා” similar to the way you type on a keyboard. These features show how interesting it is to have the Helakuru app. The Helakuru app is ready to help you in typing fonts of Sinhala. You may be familiar with your mother tongue, and you would like to type or use Sinhala, which is your mother tongue to communicate with your friends and the other parties around you. If you are going to use Sinhala as your communication mode, Helakuru is the best app available in the market. You can easily download this application and use it in everything that you do. Give this app a try. The app further has several interesting features; you could have a look at those features too. Here we go to see some of the other interesting features Helakuru is ready to offer you. The Helakuru app is supportive of sending SMS in Singlish and many other features. The Helakuru runs on a standard Android keyboard. The app is designed for system-wide support. As you use the app, you would see its vast number of features that it’s going to offer you. You can use this app even on Facebook, Twitter or other messaging app. You might need to communicate in Sinhala on other messaging apps as well, give a try in this app and you will be able to achieve your target. The technology behind this app is that it uses an inbuilt Sinhala Unicode Rendering Technology. This technology was initiated by Bhasha. Your device must not be supportive of Sinhala, but with the help of this app, you could try this app and type in Sinhala. This app supports devices that even do not have Sinhala on their device. The “Sinhala Preview Bar” that appears on your device will show you what you are typing in Sinhala though your device does not support Sinhala. According to your preference, you have the option of having the preview bar switched on or switched off. Helakuru is the right place for you if you want to type in Sinhala. You can activate the Helakuru mode by simply moving to the on-screen instructions and enabling and switching on the Helakuru Sinhala input mode. To activate settings and other modes move on to the preferences mode. You have the chance of using Helakuru thanks to the Bhasha Lanka (Pvt) Ltd. The above sections were all about features regarding the Helakuru application. All features of this application can be simply briefed as the feature of Sinhala Input Method 2i (1.Smart Phonetic /2.Smart Wijesekara), offering the Smart Phonetic (Singlish method) and you could type using phonetics. The other feature is the Smart Wijesekara layout, and you have the Voice Typing (New Feature) (Google Gboard Voice typing Include) with the Keyboard Theme where you could make use of Color theme, Image theme and Custom Theme. There is also the Helakuru Plus Portal and the Emoji Support option. You will also find Word Predictions available. You also get the Bilingual support, and there are Keyboard Layouts. There is also the System-wide support, and the Bhasha has incorporated in it a Sinhala Unicode Rendering Technology where the keyboard consists of a special Emoji Row and a Number Row. Through the word predictions, you could also learn new words and add them to your vocabulary. You can also choose emojis through Predictions. Helakuru is a standardized application for all Android devices. Earlier Sinhala typing was difficult on the Android devices, but with the Helakuru application, everything has become possible. You can easily type in Sinhala using the Helakuru keyboard. You will be surprised by the service that both layouts including the Smart Phonetic &Wijesekara keyboard are going to offer you. How fascinating is the Helakuru? If your wish is to type in Sinhala on your Android device, this is the best place. The Sinhala Unicode Rendering Technology is going to help you with Sinhala typing. The predictions that appear will be there to make your typing easy. Type the first letter and get a list of Sinhala word predictions that fits what you are typing. Helakuru is also supportive of the English keyboard. The Sinhala phonetic transliteration makes everything easy. Get ready to use one typing application to type both languages English as well as Sinhala. Without switching, you can type two languages on the same keyboard. The Helakuru has been recognized internationally as well as locally. This application has come across winning awards and awards through hard work and commitment. The app targets Sri Lankans and any SriLankan who is living abroad can also try this app. It is perfect to get in touch in your mother tongue if it is Sinhalese. This app has millions of users, and it has gained its popularity and recognition among millions of users. Who is behind this fascinating app? The Bhasha Company made this fascinating app. The Bhasha Company has been awarded for this wonderful app. The Bhasha is famous for its digital advertising solutions, OTT televisions and location tracking services. It is this Bhasha who came up with the idea of the Helakuru app. The goal of Bhasha is offering software Solutions for all Sri Lankans, and they have succeeded in their goal by coming up with the Helakuru app. They provide the best technology applications for the Sri Lankans. They go for a simple interface that remains in the memories of their users. Bhasha has done a successful job by bringing the Helakuru application among their customers. Helakuru is a software solution for people who like to communicate in Sinhala by the Bhasha company. This application is supportive on Android devices, and it comes with two layouts which are the Smart Phonetic & Smart Wijesekara. The smart phonetic runs as the default, and it also runs on a transliteration based Sinhala phonetic layout. You will find the second layout easy to handle and use. To enable Smart Wijesekara, press the Settings icon. This layout offers normal as well as shifted modes. It even comes with the nasal; in Sinhala (Sanyaka) characters. You can use Sanyaka letters in the mobile typing. You can even use this keyboard in several messaging apps. The Sinhala Unicode Rendering Technology also makes everything easy for you when typing in Sinhala. How to use Helakuru for Sinhala typing? Here is the way how you could have Sinhala typing activated on your mobile device to communicate with friends. Give this app a try and find out for yourself what possible things that you could do. Here is how you can follow the easy steps to type in Sinhala. First, you will have to go through the on-screen and switch onto the Helakuru Sinhala Input. To make things get done easily for you here are the steps in brief. First, go to device settings on the keyboard, and under keyboards, select add new keyboard and under that find Helakuru. Next, go to settings and allow full access. Next, you will have to press the globe icon which is there on the English keyboard. This way you can switch to the Helakuru keyboard. Thus you will see that this app is one of the best Sinhala typing apps and that nearly 3 million people are using this app to communicate with friends. It is well clear that this app is a popular app and that it is well-recognized since you could see it from the awards that it has received including the NYDB Awards 2016, mBillionth South Asian Award 2014, e-Swabhimani National Award 2013, and NBQSA National Award in 2014.Many Sri Lankans use this app on your device to communicate in Sinhala. Bhasha has brought several modifications on this app. For example, it has increased the performance quality of the keyboard and fixed bugs that clients had come across and then it has also brought solutions for annoying crashes. The version also supports emojis, and there is an impressive font size. The Sinhala can also be done phonetically. – Now you can even easily switch to Emoji layout You can also switch between two languages including Sinhala and English. 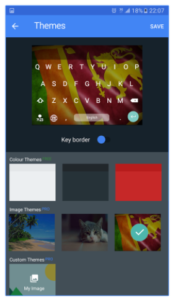 The keyboard themes are also fascinating, and as Helakuru supports both Sinhala and English, you will find this app amazing. Helakuru, as discussed above, comes as a Sinhala apps free download. You can get the Helakuru for windows phone, and Helakuru apk free download is available. The Helakuru is available as Sinhala keyboard software free download, and it’s a free download Sinhala Unicode software for a window 7 is also available. The latest release is the Helakuru for pc. You can install the add-on Helakuru for chrome for easy use, and you will find that you have this as Facebook Sinhala typing software free download. This application is simply a Sinhala keyboard for Android. You will also find a version as Helakuru voice typing for pc. This application is also available as Helakuru Sinhala keyboard for pc free download and Sinhala keyboard for Nokia Lumia. If you possess a Nokia device, you can use this application and have an amazing time. If you want this app for your PC, look for Helakuru for windows 7, 8.1, 10 or Helakuru for windows 10 free download. You can get the versions onto your device. You will find that Bhasha has come up with Google Sinhala Unicode for windows 7, 8.1, 10 and iskoolapota Sinhala Unicode free download for windows 7. Iskoola pota is a font that supports Sinhala typing. The Sinhala Unicode for windows 8.1 free download is also available. 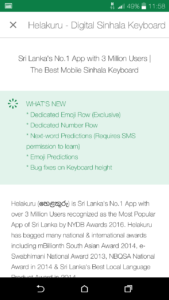 You could also look for Sinhala keyboard for windows 10 and get this Helakuru application. The Helakuru also goes as the helabasa keyman sinhala free download. Helakuru is there to make your typing faster in Sinhala. The predictions and the phonetics supports makes it easy for you to type in Sinhala. Use the same application and keyboard to type both Sinhala and English. You are going to save your time using this application with the help of predictions. Things become easy when you use this app for Sinhala typing. Self-learning is one of the other best features as you ‘re going to add a whole set of interesting Sinhala words to your vocabulary. Some words that you type may not be in the Helakuru memory, but you could save them for later use. You can easily type names, names of places and the other words that you need easily on this application. You will be able to enjoy all these features only after you get this app on your device. You will have to firstly download the app and then go one by one after the features that are available in the app. After you go through the article and get the app, you will find it easy to get in touch with the features that the app has to offer as you are quite familiar with all the features that the app is ready to offer you. How to get Helakuru app on your PC? It is a matter of following a few simple steps when it comes to getting the Helakuru on your PC. You will have to simply go to the Internet and follow the download link that is provided and add it to the web browser that you are using. You could easily add it to the web browser as an extension and use the app in Sinhala typing whenever you want. The application supports Google Chrome, so add the application to Google and then start enjoying the features. The extension will be useful to you if you are always working on social media apps. If you are a social media lover and you want to write a comment, add a status or send messages in Sinhala, you would have the best time with this application. Add the extension and start messaging in Sinhala. With pressing at once, ctrl, shift, z you can even switch between the languages Sinhala and English. This application extension is very well needed for PC operating systems that run on the Linux versions and the Ubuntu versions most because normally Windows support the Sinhala language fonts. Having this extension on Google Chrome is going to be something very useful for typing in Sinhala. However, while you use this extension, you would come across issues as it runs on the Beta. In future these bugs will be fixed, so be patient and wait for the next move by the Bhasha. Having the extension added to the Google Chrome makes it easy for you to access the Helakuru application whenever you want, and you could Type in Sinhala easily and quickly. Add the extension to your PC as you could get support in Sinhala typing while you are messaging with friends. Switch between Sinhala and English and get ready in typing using this tool. You will find that Helakuru helps to type in Sinhala on your Android device as well as your desktop or laptop. It only wants the need of one click to start typing in Sinhala. It is the same procedure that you use in typing Sinhala on your desktop as well as your mobile device. This application is extremely supportive when it comes to typing in Sinhala. As you know, the two keyboard layouts serve you in two different ways. 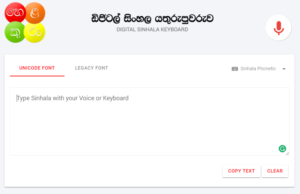 The Sinhala Phonetic will let you type Sinhala phonetically using English letters, and the Wijesekara is going to use the standard Sinhala keyboard layout. You can use this application for Sinhala typing on other websites. Helakuru is one Sinhala typing app that is supportive on Chrome and other websites. However, it has several beta limitations, and later on, you will find solutions for those limitations in future. This application has won popularity among users of Sinhala typing. You will also have to be in debt for the Bhasha as it is this company that came up with this software. Good luck with the Helakuru!